Today, friends, is the day. The day that I've been dreaming nervous sick about for the past 3 months. 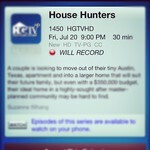 Our episode of House Hunters airs tonight, July 20th, 2012, at 9pm cst on HGTV. If you don't hear from me by Monday, it's because Jon and I have been swept off to Hollywood by Steven Spielberg to start our lives as rich and famous TV stars. Okay no, that sounds terrible, but I am thinking there is a chance Ernie will get a spinoff show or at least a role in an upcoming Disney movie (hey he can't dribble a basketball but he can play a mean game of fetch). Tonight we are having a houseful of family and friends over to watch the show, many of which were in on the filming with us, and we couldn't be more excited! A few people (who don't have cable) have asked me if it will be broadcast online and the short answer is maybe. Our producer said that HGTV does show full episodes on their website but it is a toss up as to which ones they play. You can find those episodes here. Also, our episode will rerun on HGTV in the and you can find the schedule, along with our press release here. We'd love it if you helped spread the word! For more posts on our House Hunters experience, click here. For more posts on our house, click here. So excited to see the show! I live in FL and would like to see your show. Will it come on at a different time here? Thanks! Love this show! I'll be checking it out! Hope you love how it turns out! I can't wait to watch the show tonight!!!!! Ohhh I need to figure out what time this is on for me tonight!!! I will PVR it!! Can't wait! I've got my DVR all set just in case I don't get to watch it real time! So exciting!! Yay! Can't wait. Enjoy watching it with family and friends! So exciting!! I don't have a DVR #thirdworldproblems but I will try to catch the show or a re-run. Have fun tonight, you deserve it! I don't have cable anymore but I'm hoping like heck I can catch it online or on Hulu! Have fun tonight watching with all your family and friends Ruthie, what an adventure! How FUN! I love House Hunters! I'm so excited for you!!! I'm going to try and make RJ's whole family watch it since we will be there tonight. Ill use my powers of persuasion :) Can't wait! I'll be forcing my family in Oklahoma that I'm visiting tonight to watch it with me! Actually, the crowd I'm going to be around will probably love it...especially when I tell them I "know" the star! Woohoo! Can't wait to see it! can't wait to see the episode!! You couldn't touch or hold hands? Why not? That sounds weird to me. In other news, congrats, this is an exciting day for you! Can't wait to see it!!! Yay!! i have it set to record. :) i'm excited. i'm praying for the victims and their family. i went to high school with the shooter. there are helicopters flying over the neighborhood like crazy trying to get to his mom. I already have it set up to record! Oh, and why couldn't you guys hold hands or touch really? I'd buy a diffent house if it would make blogging easier too. You go girl. I'm watching House Hunters and saw your blog! I love it!! We are watching your debut from Spartanburg SC. We love HGTV and you guys are the cutest couple! Hey I saw shalyn's tweet about her friend being on house hunter's and checked it out! but then it started storming! will have to see a rerun sometime. y'all were great! that is so weird about no hand-holding thing. ok, this is why I hate being so busy and never being able to blog. I ALMOST miss amazing things like this!! Thank goodness for instagrams and the luck that would be my night off!! Oh, Ruthie! I LOOOOOOOVED seeing you guys on TV and enjoying that experience with you! Your house... OH. YOUR. HOUSE. It is so so beautiful! I absolutely love what you did with it and actually gasped when I saw the "after" of the entry way!! GORGEOUS! Now, the only question is- when can I come visit?!?!?!?! I just watched the show and guessed which house you picked correctly (dh however was wrong on his guess). Can you tell me what green and blue paint colors you used in the house? They looked so refreshing! Saw your show. Can I ask where you got that sign about having a dog. Believe it was on your bar. Loved it. Thanks. Watching you now and will follow your blog now too. We loved your episode tonight on House Hunters and we found your blog by watching it!!! I am here with my two grandchildren Catherine and Adrienne and I love that you are a Christian!!! We were wondering if you made your blue necklace because it is beautiful and I would like my granddaughter to make it for me!! If you did make it could you please give us the insrtuctions and if you bought it, where did you buy it at and how much was it?? We looked on your Pinterest (we saw a rickrack flower and thought it was pretty) but I dont think we saw the necklace you were wearing!! I enjoyed watching your episode on House Hunters tonight. Your home is beautiful! So happy to find your blog & follow here and on Pinterest, too. Just popped in to say hello! Watching ya on my fave show House Hunters. Hope ur are enjoying your new home! watching house hunters, you guys reminded me of everyone I know in Texas, so thought I'd do some googling! I grew up in a house just like the '96 house you looked at, too funny about the carpet + tile. We have very different tastes though, we moved to Seattle and wouldn't look at anything newer than 1930! Woke up after falling asleep on couch. House Hunters was on a second run, so I proceeded to watch it and saw your blog mentioned. It is a very nice blog, and you look like such a nice couple. I love Ernie. I very much like the house you chose. Very pretty. Like the paint color, which is almost the same as mine. Hope you will continue to enjoy your house. Much success on your blog. You can also check out my gardening blog or follow me on Pinterest. No lie....hgtv just happened to be on at my grandparents house. When I saw you and jon I mightve freaked out!! Loved it!!! Hey Ruthie!! I'm a HUGE House Hunters fan and a blogger as well!! Just watched your episode with breakfast this morning - after shooting photos with some natural light ;) I loved watching and the house y'all chose! So fun to see another blogger featured. so awesome, ruthie!!! i missed it yesterday but will totally look for it on demand or catch the recording. watched your episode, so glad they included a shot of your blog so i could scope it out! love your blog and love the house you picked! I loved your episode! I have seen you around in the blog world before, but had never stopped to check out your blog. I absolutely adore your chevron wall! The house you picked is perfect! Hope y'all are enjoying it! Love the house you chose and the blog! Best of luck!! I totally missed the episode :( I've looked to see if it re-runs any time soon but I can't find it... So sad! Saw the name of your blog while watching the episode of House Hunters! I've seen shows where the couple couldn't walk from room to room without holding hands so it surprises me that you said you couldn't touch each other. Ruthie, I'm so upset! I set my DVR to record the show, I go to watch it tonight and it's not there! I have no idea what happened and am so bummed! I will be stalking that link to see when it will air again! Just watched your show on my DVR, saw you had a cute blog and had to check it out!!! Y'all are adorable--and fellow Texans! Excited to keep up with you :? I just saw your episode and I was all "oooh a fellow blogger, and a Texan too"
Love the "behind the scenes". Looks like you are having fun in your new home. And I found your blog when I just "happened" to watch your episode!